These options are used throughout the CGoban client. The language you see all client text in. Some of the text may change to the new language immediately, but you must exit the client and restart it for the complete change to take effect. To switch between complex script languages (like Japanese) and Latin based script languages (like English), you may have to reinstall the CGoban client. The "System Default" language option uses your computer's default language. The name of the computer running the KGS server. 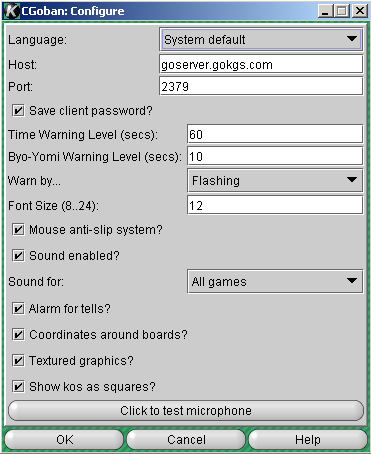 You should leave it as "goserver.gokgs.com" unless you are using a port forwarder. If you don't know whether you are using a port forwarder or not, then you aren't, so leave it at the default value. The TCP/IP port of the KGS server. The default is 2379; leave it this way unless you are using a port forwarder. Saves your password on your computer. Don't use this if you are on a shared computer! The amount of time remaining before the client begins warning you that your time running out. For example, if the Time Warning Level is 60 seconds then the client warns you when you have 60 seconds remaining on your clock. This is similar to the previous setting except this setting is for byo-yomi time. Related to the two previous settings. Flash: Flashes the time clock for each second that passes during the warning period. Both: Turns on both the "Flash" and "Beep" warnings. Sets the font size of the client text. The minimum allowed is 8 point, and the maximum is 24 point. Toggles the "Mouse anti-slip System". This system rejects a mouse-down event if the mouse cursor moved in the last second or so. This helps prevent misclicks. Toggles the CGoban3 sound system. The games you select in the popup list. My Games: Turns on sound only for the games the user is playing in. This alarm tells you that you have a PM when you are playing, reviewing, or watching a game. In fact, this alarm announces a PM whenever the focus is not on the Main KGS Window. When the alarm goes off, it sounds like a telephone is ringing. Toggles the coordinates that display on the edges of the board during games. Note that pressing CTRL L in a game is another way to toggle this setting. Makes the board look like more a real wooden board. A small square shows where you are not allowed to move because you would retake a ko. This is especially useful in blitz games. To use a microphone on KGS, you need a teaching account. When you click on this button, a window comes up with step-by-step instructions for testing your microphone.